The busy season is upon us. Snow and bitter cold lie behind, and sunny days are on the horizon. There are a million things to get done and it all seems like it had to be done yesterday. Don’t panic! Now is the time to set your sights on the summer months. 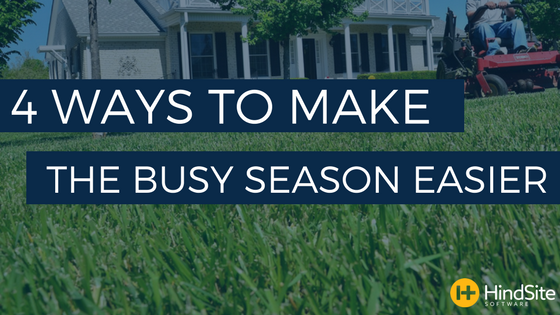 Keep these tips in mind when gearing up for a great season for your green industry business. Make a plan. Have goals. There has to be a clear and direct vision for your business model, and all personnel have to be clued-in for it to work. Set up meetings and huddles with key team members to go over strategy for optimizing sales. Have a drawn-out timeline of where you were last year, where you are now, and where you expect to be by season’s end. Along the way, set short-term goals. This can be a great way to mark little ‘victories’ to rouse spirits in the dog days of summer. Take the time to really train your field crews. Making mistakes is just another part of life, but it doesn’t belong in your field service business. Be liberal when reserving time to go over procedure with your employees. It’s the ultimate confidence booster going into a job feeling like you have some expertise to fall back on. Without a comprehensive training program, whether it be an hour here-and-there or a week-long informative seminar, mistakes are likely to be made. Get this done early and it will set the tone for the season ahead. Give your equipment the second look it deserves. Is everything serviced? Could you break out the heavy machinery tomorrow if you wanted to? It is often the case that field service managers will consider a lawnmower “good-to-go” if the engine starts. If this is your business plan, you have a tough road ahead. Equipment inspection means inspecting your equipment. Look for structural damage. See if you can find weak joints or loose bolts. Run some tests. You’ve got to be willing to seek out problems now so you don’t have to worry about them next month.